White papers, downloadable content, guides and checklists showcase your expertise, woo prospects and win sales. These stealthy rainmakers aren't just for IT geeks! In fact, if you’re reading these words, chances are high that you’ve seen our insurance white paper offer. You might have even taken the next step to request our free report, "Ten Marketing Mistakes That Are Costing YOU Sales Right Now!" A lot of people do. And when they do, they are in essence, volunteering to step into our sales cycle. They agree to give us a name, e-mail address and phone number in exchange for this valuable information. This is information that we would never receive otherwise. Without our white paper and downloadable content offers, visitors would leave our site empty-handed, robbing us of the opportunity to follow up with them. If so, allow to us to introduce you to a reliable, yet often-overlooked online lead generation tool – the white paper. The white paper is a content marketer’s best friend because it represents a very compelling offer that leads to an easy first YES. As you know, business people are information-hungry. They are constantly searching for ways to do their jobs faster, smarter and better. They will respond to a small offer for valuable information much faster than they’ll pick up the phone and call you. White papers don't have to be technical and long. In fact they can be as short as two pages IF the information provided is unique and valuable to your prospective buyer. If you feel overwhelmed by the prospect of creating a white paper, never fear. We'll interview you by phone to capture your thoughts. Then, we’ll transform your thoughts into a very compelling report with a catchy title. If you have an idea you'd like to develop, but not a lot of details, we can conduct research. Once your white paper is ready, you’ll find countless ways to use it. As you can see, the white paper is a tool you can’t afford to live without. Learn more on how to convert leads with white papers and downloadable content below. Want to Outsource Your White-Paper Writing? White papers and downloadable content are great tools for converting leads. In B2B content marketing, a “conversion” occurs two times – when a website visitor becomes a lead and when a prospect becomes a customer. When prospects first arrive at your site, they’re typically not ready to buy … yet. They are in research mode. That’s why they rarely respond well if you hit them over the head with a free quote offer. Instead, the key is to offer content that will empower their buying decision. 1. Engaging Web Content: Most buyers want to educate themselves before they ever reach out to you. Be sure that your website is equipped to educate. Use infographics and charts to illustrate key messages, and use blog articles to provide up-to-date information. On-screen content should make visitors feel comfortable that you are a good potential partner. 2. Content Offers: For visitors who want to dig deeper, you need to offer premium downloadable content. But there’s a catch – this content is not available to just anyone. Visitors have to complete a few fields in a form to obtain it. If and when a form is completed, the visitor becomes a lead and you’ve attained your first conversion. That’s why the form is essential. Without a form, you don’t have a lead. You have no way of continuing the interaction. Top-of-funnel: Top-of-funnel offers are for buyers just beginning the research process. They are recognizing a problem/opportunity and conducting research to gain better understanding. Offers for this audience may include: White papers, e-books, FAQ sheets or buying guides. Keep this content general and non-promotional. It should feel unbiased. Middle-of-funnel: These offers are for visitors who thoroughly understand the problem/opportunity and are looking for the best solution. These visitors are closer to the buying decision and have longer attention spans. In fact, they may have already downloaded a top-of-funnel offer and now they’re ready for more. Offers may include: Case studies, step-by-step guides, podcasts, videos and solution comparisons. Bottom-of-funnel: These offers help prospects make a final buying decision. They may include: Vendor comparisons, customer testimonials, trials, pilots, product literature, case studies and get acquainted kits. 3. Content delivery tools: To deliver your content, you’ll need call-to-actions, landing pages and thank you pages. A call-to-action a callout or button that invites visitors to get more information. 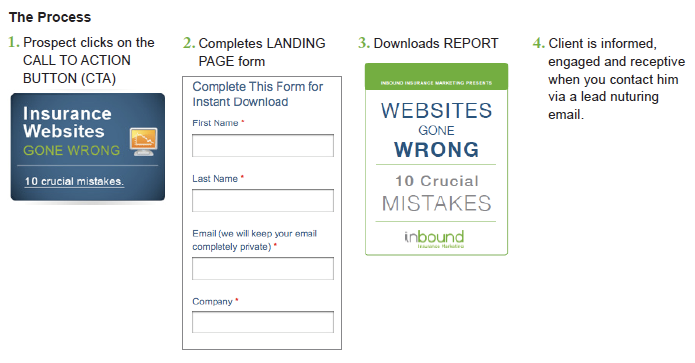 When visitors click, they arrive at a landing page which includes a form to complete. Once the form is completed, visitors are taken to a thank you page where they can download the content. The bottom line: If you like the idea of helping your sales team to become more productive, you have to make your website more than just an online brochure. It can become a lead conversion machine if you have the elements listed above. If your website does not generate any leads, this is most likely the issue – you don’t have the correct lead generation structure in place.